Aboriginal Dreamings Gallery has 25 years experience sourcing unique art and craft suitable for gift giving, corporate gifts and presents for conference delegates and keynote speakers. Australian Aboriginal art is the perfect gift for friends and relatives, wedding presents and corporate gifts. 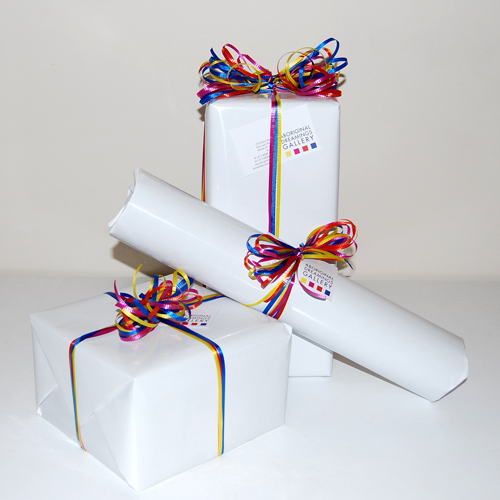 With care and attention to detail, the gallery offers free gift wrapping to suit each occasion with special attention given to wedding and christening presents, corporate gifts, farewell presents, birthdays and other celebrations. The Gallery stocks a selection of Aboriginal artefacts and Australian gifts for conferences, diplomatic gifts, office presentations and awards. Aboriginal Dreamings Gallery works with clients in advance of conferences and events to prepare tailored conference gifts for delegates and keynote speakers. Indigenous design products ordered in advance, are available in bulk for inclusion in conference satchels. Aboriginal Dreamings Gallery offers a free gift registry service for families, friends or work colleagues to contribute towards a special artwork for an important celebration, wedding, birthday, christening, graduation, work presentation or farewell gift. A group lay-by through the gift registry enables friends and colleagues to contribute towards an important artwork that will be valued and cherished. Aboriginal Dreamings Gallery stocks a wide range of gifts including Aboriginal art, craft and artefacts, hand-crafted jewellery, hand-made glass by some of Australia's best glass artists, limited edition prints and a large range of Aboriginal art books. Aboriginal art is a special purchase, our staff ensure that your gifts are beautifully, and safely wrapped, suitable for all occasions. Aboriginal Dreamings Gallery is open 7 days, 10am - 5pm. Our staff are happy to provide expert advice and assist with all gift giving.